Apple use three subsidiaries in Ireland to help massively reduce their exposure to tax, letting Apple Sales International pay just $10m in tax on a sales income of $74bn in 2011. On the evening of 3rd June 2013, a flashmob including comedians Mark Thomas, Nick Revell, Chris Coltrane and Tiernan Douieb stormed the Regent Street branch of the Apple Store to highlight the corporation’s multi-billion-pound tax-avoiding Irish-subsidiaries ruse (more on that here: www.guardian.co.uk/technology/…). 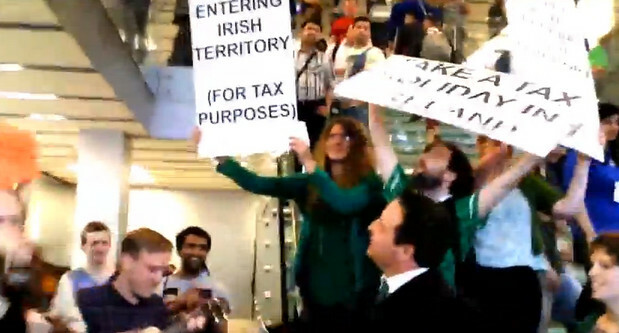 We temporarily turned the store into Irish territory with music, dancing, flags, posters and messages about their iDodge on many of their big screens. A good craic was had by all. 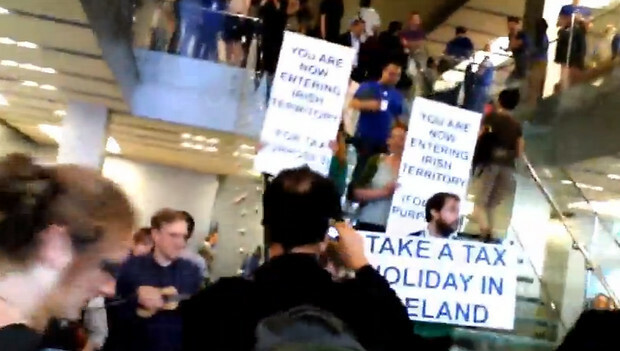 Banners diplayed captions like, “Take a tax holiday in Ireland” while the screens of computers and tablets in the store were altered to urge customers to buy the same goods in the nearby John Lewis store.